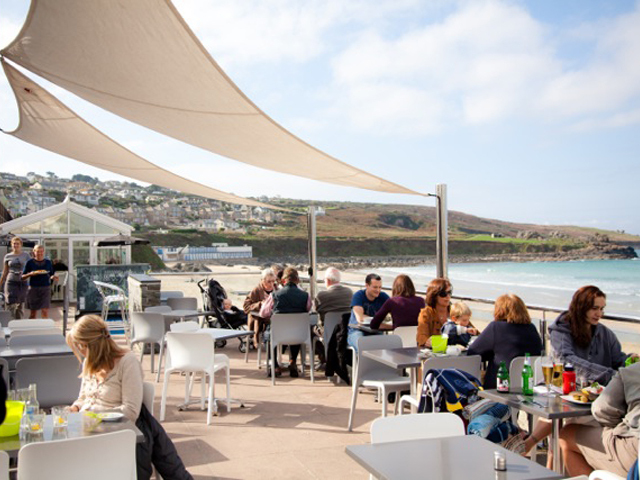 There isn’t really a better spot on Porthtowan to watch the sun go down with a stonebaked pizza or juicy blue-cheese burger and a glass of wine. Just make sure you get a seat in the window booths. 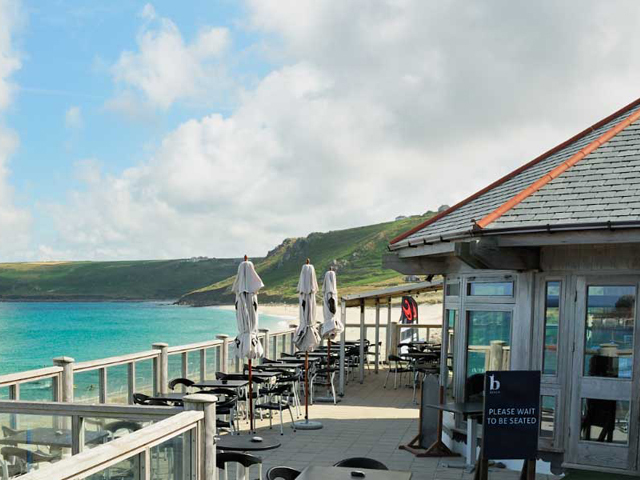 You can even keep an eye on the surf via Blue Bar live webcam, so you don’t turn up and find a windy, onshore mess. It can get lively during the weekends with live music and comedy acts, plus a pool table to keep you entertained if music isn’t your thing. Open Monday to Friday 10am – late, Saturday 10am – Midnight, Sunday, 10am – 10.30pm. Food served from 10am-9pm. There aren’t many places where you’ll find a café, church, skate ramp, art gallery and general hang-out spot, all rolled into one building. The Tubestation is almost invisible from Polzeath Beach, tucked up behind the car park. 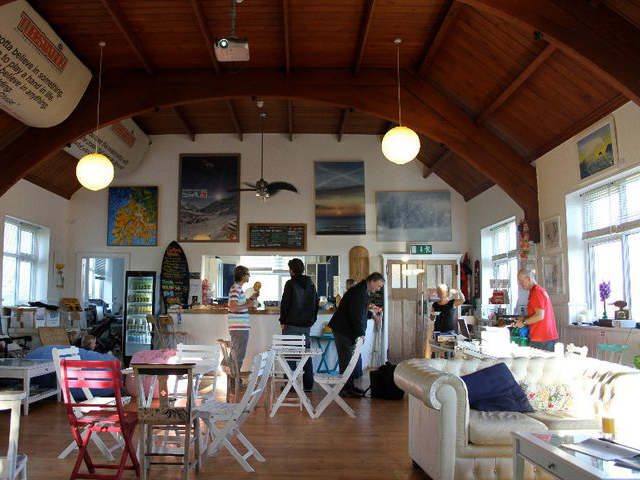 But it’s the cosiest place to chill out in Polzeath with giant bean bags and squishy sofas where you can relax with the Tubestation’s very own blend of coffee, Tube Time, and the latest surf magazine. 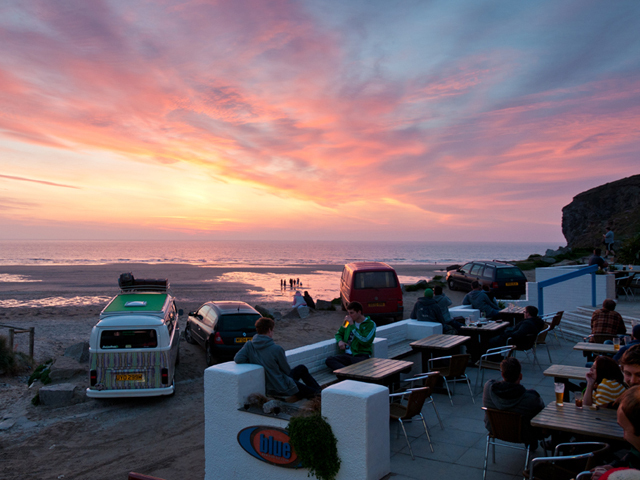 Free WiFi, bacon butties, superfruit smoothies and the best chocolate tiffin around makes this an ideal stop-off post surf. If you’re looking for something a bit special for breakfast after your dawn surf, this is the place to come. Buttermilk pancakes with pecan butter and bananas, scrambled eggs with crab and crème fraiche or eggs any which way. Plus they also serve tapas from lunchtime onwards, always a great option when you can’t decide which dish to eat. Open Monday to Friday from 9am. Evening meals only on Saturdays and Sundays. As the name suggests, this café practically has sand creeping through the front door it’s so close to the sea. 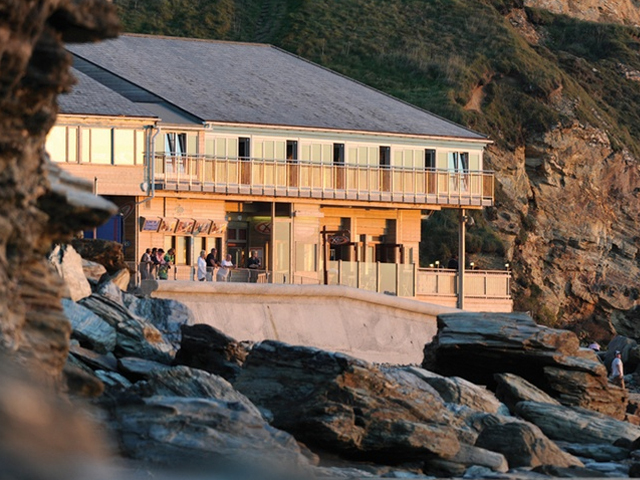 With superb views over Watergate Bay, it’s a great spot for checking out the surf before your brave the cold water. Their menu works on this sentiment – it’s all warm comfort food – from crab soup with melted gruyere croutons to their slow-cooked pulled pork sandwich. The Extreme Hot Chocolate was even once voted by The Sunday Times as one of the 50 things to do before you die. Great for a warming up after a dip in the sea. This place is more of a restaurant than a café – not somewhere you’d go wandering into in your wetsuit but the food is delicious and they serve some serious sandwiches. Steak ciabatta with marmalade and handpicked crab with chilli and coriander are among some of their lunchtime bites. Plus sustainability is a key priority, they try to source their food from suppliers within a ten-mile radius.